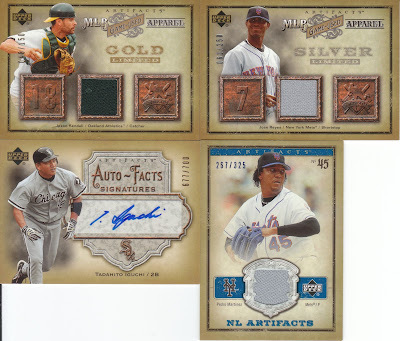 The Mets really racked up the hits in this break! Congrats to Jeff, Doug and Steve for hits in the final box! Curses! Shut out again! At least I need the commons. Since I cleaned up, if someone got skunked for hits, they can have 1 of my Prince Fielder rookies from one of the earlier boxes. It's only a base, but it is a nice base. Apparently, the whole enchilada was already packed and weighed and postaged. Sorry, folks! Damn you Jeff, for beating me to this break. I hope this means you won't be stealing my Iguchi auto now! Yes yes yes. It's safe. Funny, Sam - as the video starts I say to myself "Ok, no more Rays in this last box." HA! I had the Rays & I was hoping for Tigers . I kept saying no more Rays !! !